Look for this sign when traveling on Highway 76.
and the Pauma Valley Community Center on 76.
is 16608 State Highway 76 in Pauma Valley. Center Road in Valley Center. Follow Cole Grade Road down into Pauma Valley. Cole Grade Road will end at State Highway 76. Take a right and follow it for 4.5 miles. Saint Francis Church is on the left side, 1 mile past El Rey's Mexican restaurant. From Temecula/Bonsall: Take the 15 Freeway south to the Highway 76 exit. Go east on Highway 76 for 14.6 miles. Saint Francis Church is on the left side, 1 mile past El Rey's Mexican restaurant. From Palomar Mountain/Julian:Take Highway 76 North from Highway 79. Follow it past Palomar Moutain and past the Valley Center Road round-about at the base of the hill. 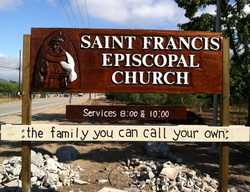 Saint Francis Church is on the right hand side, 1.7 miles past the Valley Parkway intersection.